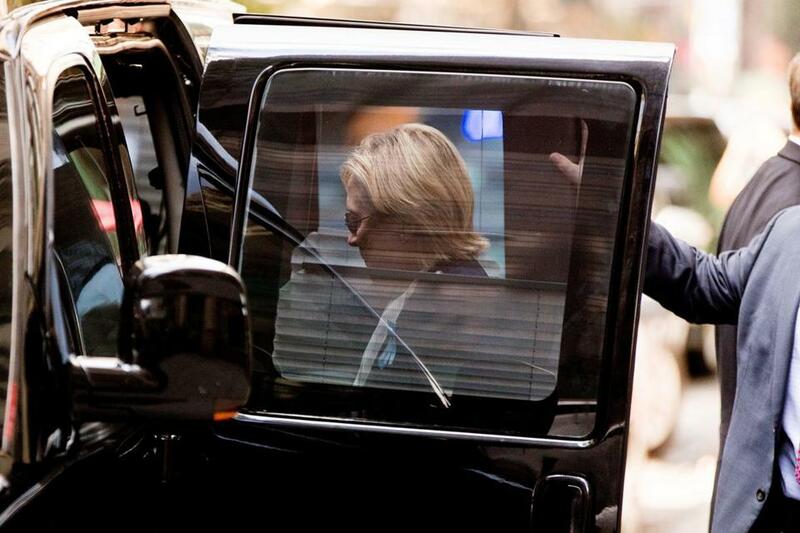 Hillary Clinton left her daughter’s apartment Sunday after recuperating. She had become ill at an event earlier in the day. WASHINGTON — Hillary Clinton and Donald Trump both pledged Monday to release additional personal medical records after Clinton’s near collapse Sunday morning at a Sept. 11 memorial event and subsequent disclosure that she is suffering from pneumonia. As she recuperated at home in Chappaqua, N.Y., after canceling this week’s fund-raising trip to California, Clinton’s campaign grappled with the fallout over its delayed explanations about why she abruptly left the memorial event. The episode, and questions about limited medical transparency by both candidates, makes it likely the health of the two presidential candidates — two of the oldest ever to seek the Oval Office — will continue to command attention eight weeks before the presidential election. 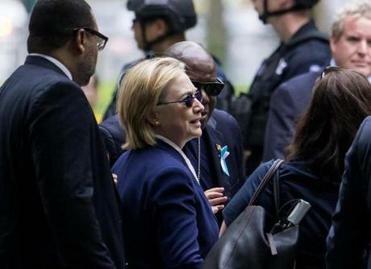 Clinton was diagnosed with pneumonia Friday but the illness was not disclosed until Sunday after Clinton stood outside in warm, humid air for the memorial service and became dehydrated. Video images repeatedly shown on television showed her struggling to stand and on the verge of collapse as she was helped into a black van. Trump, too, is in a treacherous position on the question of medical transparency. Hillary Clinton abruptly left a 9/11 ceremony after feeling ‘‘overheated,’’ and video later showed her stumbling and appearing to fall off a curb. At 70, he’s 16 months older than Clinton and has released even less information about his health than Clinton, providing only a four-paragraph letter that his doctor said was written in five minutes. It claims with little factual support that Trump would be the healthiest president to assume office in US history. Clinton’s letter from her doctor, which runs eight paragraphs, includes less hyperbole than Trump’s report, but is still scant on basic information typically released, including the candidate’s height and weight. Clinton’s team didn’t provide a timeline for when she would release addition information or how much would be added to the public record. Trump maximized the drama by saying he’ll offer more details Thursday when he appears on “The Dr. Oz Show,” a daytime television talk program. Clinton wasn’t photographed by the press Monday but she did do a telephone interview with CNN and sent a text to supporters. She will be sequestered at home for “the next two days” while she recovers from her illness, according to her spokesman Brian Fallon. Fallon offered some regret in the campaign’s slow response to reveal information about Clinton’s health. Reporters were kept in the dark about Clinton’s whereabouts for about 90 minutes after she was caught on tape stumbling into the van. “I think that in retrospect we could have handled it better, in terms of providing more information more quickly,” he said on MSNBC. The day’s most stinging rebuke to Clinton came from a fellow Democrat: David Axelrod, an architect behind President Obama’s rise, who turned to Twitter and posted a succinct zinger that was repeated on cable TV shows all day. To answer this question, Clinton’s team put top campaign staffers in front of television cameras for a series of interviews. They tried to deflect the criticism about Clinton’s transparency by complaining that Trump has stonewalled over his taxes and has released little about his health status. Still, the series of interviews left her campaign staff making awkward comments. “She’s not contagious,” said Fallon during one interview. “My understanding is she did not lose consciousness,” said Clinton campaign manager Robby Mook in a different exchange. Trump, who has publicly sought to stoke concerns about Clinton’s health and stamina, showed uncharacteristic restraint through the day, addressing Clinton’s health only briefly and when asked about it. “I was thus deeply shocked and alarmed this Friday to hear my opponent attack, slander, smear, and demean these wonderful, amazing people who are supporting our campaign,” Trump said. Trump left it to other Republicans and the media to focus on Clinton’s health. “I don’t think they’ve handled it yet,” former House speaker Newt Gingrich said in an interview. “You can’t be at the single biggest event in the country and collapse and not have people asking questions,” added Gingrich, who was a presidential candidate. Gingrich noted that the Clinton team missed an opportunity to show off her dedication. Had the campaign disclosed her sickness Friday, he said, she would have looked heroic for insisting on commemorating the anniversary of the terrorist attacks. Ari Fleischer, who was press secretary to President George W. Bush, said his team learned the hard way how it important it is to be up front about a candidate’s health: The president was heavily criticized when he had cancerous cells removed from his face at Camp David without telling anyone. The Bush team took the lesson to heart: Later when Bush choked on a pretzel and fainted, the White House went to great lengths to inform the public quickly. John McCain, who suffered from well-documented war injuries in the hands of the North Vietnamese, allowed reporters to review hundreds of pages of his medical records. No matter how healthy a candidate may be, getting sick on the campaign trail is typical, campaign veterans said. “Everyone on campaigns has walking pneumonia,” said Arun Chaudhary, a Democratic strategist with the firm Revolution Messaging who worked on Bernie Sanders’ primary campaign. Chaudhary said Jane Sanders, the candidate’s wife, had a cough that started during the February New Hampshire primary and lasted clear through the California primary in June. “That is what it is to be on a campaign. It is a petri dish,” Chaudhary said.